Gov. Peter Shumlin was elected to a second term as chairman of the Democratic Governors Association on Monday, the organization announced. As such, the Vermonter will lead Democratic efforts to win the 36 governorships up for grabs in November 2014. Of those, 22 are currently held by Republicans. Shumlin was first elected to lead the partisan political group last December, when he hadn't quite finished his first term. In his first year as DGA chairman, the organization helped Terry McAuliffe recapture Virginia for the Democrats. The DGA sat out the year's other gubernatorial election, in New Jersey, where Gov. Chris Christie easily won reelection. "By focusing on the issues that matter in the everyday lives of middle-class families, the DGA won a major victory in Virginia this year," Shumlin said in a written statement released after his reelection. "In 2014, we will build on that momentum and communicate how Republican governors across the country have pursued a failed economic philosophy that rewards the wealthiest at the expense of the middle class and critical investments in education. I appreciate the support of my colleagues, and look forward to the important work of growing the ranks of Democratic governors." Shumlin's victory came during the DGA's annual meeting in Washington, D.C., Monday afternoon. But bad weather and canceled flights delayed his arrival in the capital and kept him from attending his own reelection. It's unclear whether any other Democratic governors sought the top job, though DGA elections are typically uncontested. DGA spokesman Danny Kanner did not reply to several emails and phone calls since Thursday. Shumlin was not available for comment Monday, a spokesperson said. The organization also elevated several other relatively junior governors to top leadership posts Monday, according to a DGA press release. New Hampshire Gov. Maggie Hassan was elected to replace Colorado Gov. John Hickenlooper as vice chair. Washington Gov. Jay Inslee will replace Maryland Gov. Martin O'Malley as finance chair. And Montana Gov. Steve Bullock was elected chair of the governors' cabinet. Hassan, Inslee and Bullock were all first elected in 2012. According to Politico's Alexander Burns, the DGA's senior staff "is expected to stay intact heading into the new year." The organization's executive director is former O'Malley adviser Colm O'Comartun, who retained his job when Shumlin replaced the Maryland governor as DGA chairman last year. Former Shumlin chief of staff Bill Lofy, a Vermonter, serves as a senior adviser to the DGA and as Shumlin's liaison to the group. 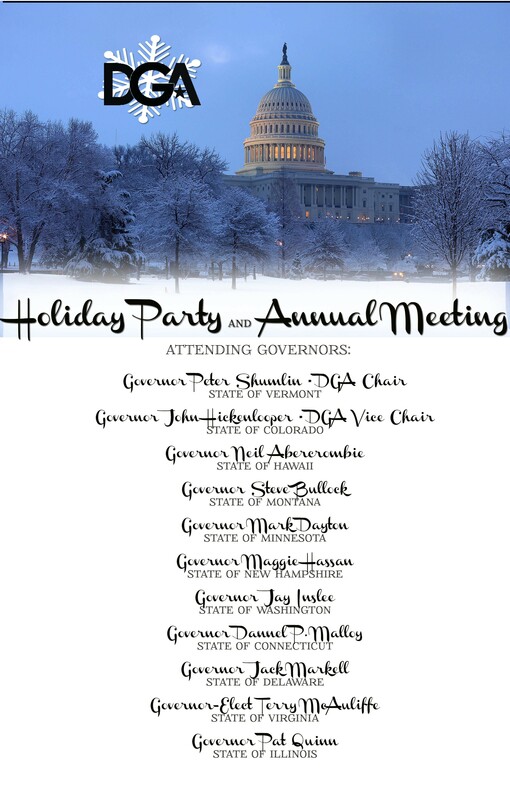 In addition to Monday's annual meeting, the DGA also plans to hold its annual holiday party Monday night (see invitation above), at which 11 Democratic governors are expected to mingle with the organization's top donors.